As I exited the screening of American Reunion, a line of mostly teens had wound its way throughout the theater’s lobby, out the portico, across its long façade and down an alleyway leading into the parking lot. The object of their patience and persistence was a midnight showing of The Hunger Games debuting in a few hours. Today’s teenagers are more energized by films about a post-apocalyptic adolescent blood sport, a boy sorcerer-turned-savior, and the romantic lives of teen vampires/werewolves. The generation now driving the Judd Apatow comedy machine is comprised of thirty-somethings once weaned on a diet of American Pie and other similar confections. Thirteen years after Jason Biggs famously defiled pastry onscreen, he and the full cast complement reunite for the first time since 2001’s American Pie 2 (Chris Klein, Tara Reid and Mena Suvari were wisely AWOL from the woeful American Wedding). 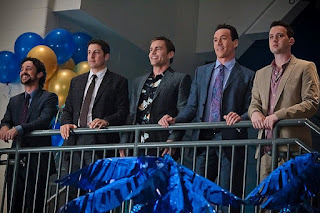 Their characters venture to East Great Falls, Mich. for their class reunion, an occasion which essentially acts as the conduit for exposing the gang’s chronic and varying degrees of arrested development. And as with most high school reunions, the ex-classmates really haven’t changed much. Jim (Biggs) and Michelle (Alyson Hannigan) are still grappling with sexual repression, today the byproduct of marriage and parenthood. Oz (Chris Klein), now a TV sports anchor, is the affable dim bulb secretly pining for Heather (Suvari). Finch (Eddie Kaye Thomas) is a frustrated renaissance man. Kevin (Thomas Ian Nicholas) and Vicky (Tara Reid) are insufferable bores. And Stifler (Seann William Scott) is still, well, Stifler. The differences are as cursory as they are inconsequential: Jim and Michelle have a kid, Oz is famous, Stifler has a job he hates, Kevin has a beard, etc. The one potentially intriguing plot turn comes when we learn that Jim’s mom died three years ago. This sets the stage for some welcome, albeit fleeting mature conversations between Jim and his dad (Eugene Levy), and also the film-saving spectacle of Levy getting blitzed and half-baked with Stifler’s mom (Jennifer Coolridge). Jim also becomes the object of affection for Kara (Ali Cobrin), a curvy, 18-year-old wild child. Jim hasn’t seen Kara since she was the little girl next door he used to babysit, an oddity considering since you’d think they would’ve run into each other at his mom’s funeral. Scatology and other assorted gross-out gags are plentiful, as you’d expect. And of course, there are embarrassing revelations and plot-propelling mishaps and miscommunications. Stifler defecates into somebody’s cooler; Jim gets caught in varying states of undress; Oz endures a replay of his kitschy, bare-chested appearance on a TV celebrity dance show. It’s all apropos of nothing, as the real reason for this Reunion is one more chance to milk this franchise cash cow. Unfortunately, much like Shannon Elizabeth only bothering herself with a one-scene walk-on, young moviegoers have moved on to other fare. Fans of the original will smile and even chuckle in recognition. But, like most post-high school gatherings, American Reunion is a nostalgia rush whose usefulness quickly fades.